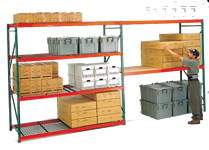 Our Regular Duty and Heavy Duty pallet rack now feature 3” x 3” columns and 5” x 8” seismic base plates. Regular duty uprights are constructed of 16-gauge steel and provide 16,100 lbs. capacity per upright. The heavy-duty uprights feature a 23,300 lbs. 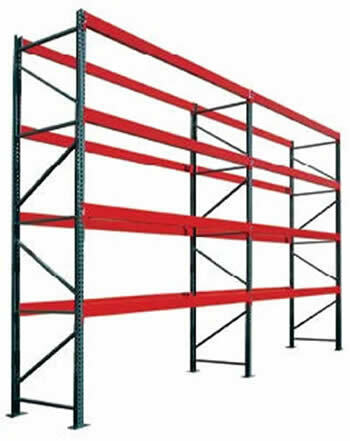 capacity and are constructed from 14-gauge steel (regular and heavy duty capacities are based upon a maximum shelf spacing of 36”). The new bolt together design provides a lower cost of ownership because components can be easily replaced when damaged during use, while traditional welded uprights require replacement of the entire upright. 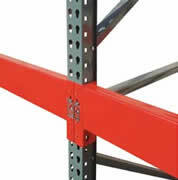 Pallet rack beams now feature an improved safety clip which allows for easy replacement of damaged clips. 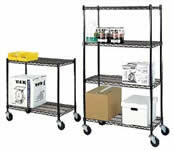 Racks are designed for use with a forklift (or other hydraulic or electrical lift) or for heavy duty hand stacking. Uprights are sold either K.D. or assembled. Popular tear drop design insures interchangeability with most major pallet rack manufacturers. 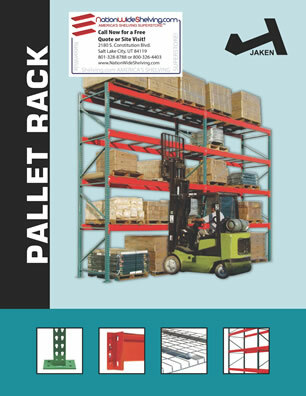 Interchangeable with the following pallet rack manufacturers: Interlake (Original Style), Space Rack, USP, Lodi Metal-Tech, Steel King, and Husky. Featuring a new and improved 3” x 3” standard column design and 5” x 8” base plate. Regular duty uprights are constructed of 16-gauge steel with a 16,100 lbs. capacity. Heavy duty uprights feature 14-gauge steel construction with a capacity of 23,300 lbs. 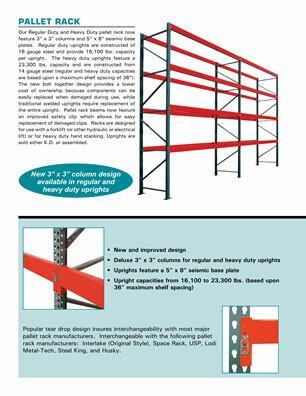 (regular and heavy duty capacities based upon 36” maximum shelf spacing). Uprights utilize a bolt together design for easy replacement. Beams can be adjusted every 2”. Uprights can be shipped assembled for an additional charge per upright. Color: Light Green. Deluxe form beams feature an improved safety clip which can be easily replaced. 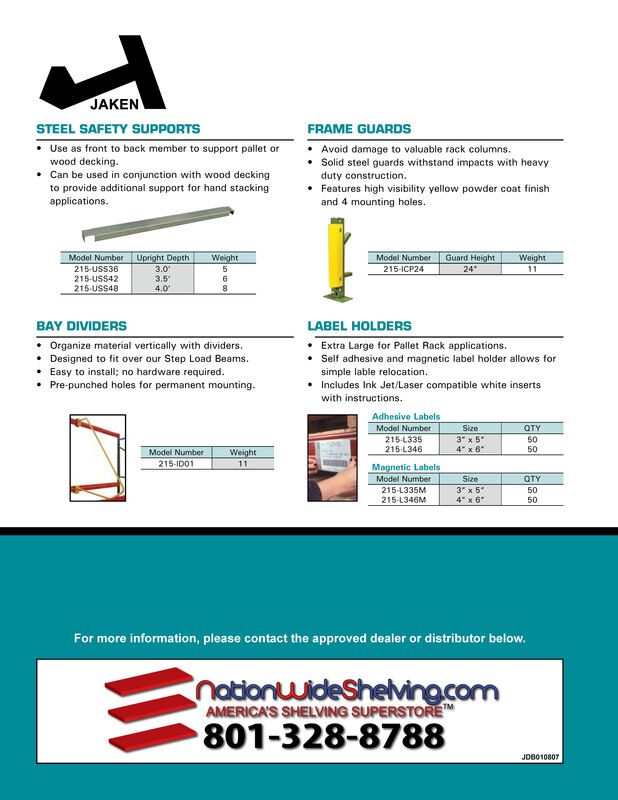 Beams are interchangeable with most major pallet rack manufacturers. Beam length is measured by clear span between uprights. 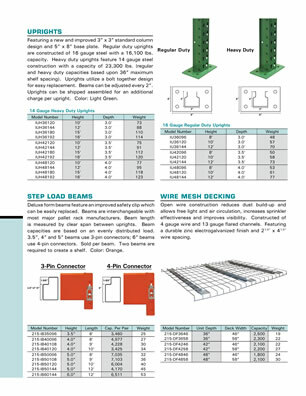 Beam capacities are based on an evenly distributed load. 3.5”, 4” and 5” beams use 3-pin connectors; 6” beams use 4-pin connectors. Sold per beam. Two beams are required to create a shelf. Color: Orange. Use as front to back member to support pallet or wood decking. Can be used in conjunction with wood decking to provide additional support for hand stacking applications. Avoid damage to valuable rack columns. Solid steel guards withstand impacts with heavy duty construction. Features high visibility yellow powder coat finish and 4 mounting holes. Organize material vertically with dividers. Designed to fit over our Step Load Beams. Easy to install; no hardware required. Extra Large for Pallet Rack applications. 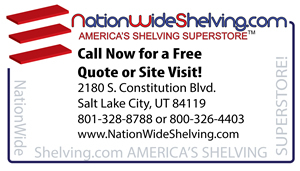 Self-adhesive and magnetic label holder allows for simple label relocation. 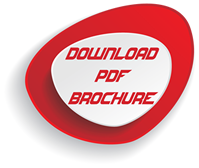 Includes Ink Jet/Laser compatible white inserts with instructions.